In this video, Dr. Huntoon discusses Low Back pain and what you need to be aware of if you have it. Did you know that 80 % of people will experience debilitating low back pain in the course of their life? Do Not let this be you. Dr. Huntoon specializes in ALL the reasons for Low Back pain and would look forward to helping you with yours so you can get back to your life. The back is an intricate structure of bones, muscles, and other tissues that form the posterior part of the body’s trunk, from the neck to the pelvis. The centerpiece is the spinal column, which not only supports the upper body’s weight but houses and protects the spinal cord — the delicate nervous system structure that carries signals that control the body’s movements and convey its sensations. Stacked on top of one another are more than 30 bones — the vertebrae — that form the spinal column, also known as the spine. Each of these bones contains a roundish hole that, when stacked in register with all the others, creates a channel that surrounds the spinal cord. The spinal cord descends from the base of the brain and extends in the adult to just below the rib cage. Small nerves ("roots") enter and emerge from the spinal cord through spaces between the vertebrae. Because the bones of the spinal column continue growing long after the spinal cord reaches its full length in early childhood, the nerve roots to the lower back and legs extend many inches down the spinal column before exiting. This large bundle of nerve roots was dubbed by early anatomists as the cauda equina, or horse’s tail. The spaces between the vertebrae are maintained by round, spongy pads of cartilage called intervertebral discs that allow for flexibility in the lower back and act much like shock absorbers throughout the spinal column to cushion the bones as the body moves. 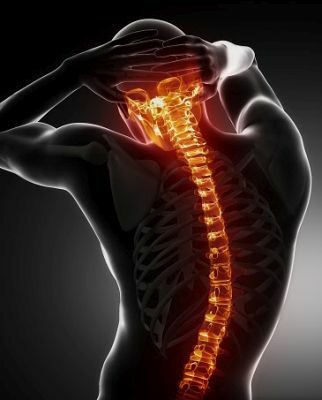 Bands of tissue known as ligaments and tendons hold the vertebrae in place and attach the muscles to the spinal column. Low back pain may reflect nerve or muscle irritation or bone lesions. Most low back pain follows digestive imbalances from changes in diet or eating too many vegetables (salads) or high fiber foods. Low back pain also follows injury or trauma to the back, but pain may also be caused by degenerative conditions such as arthritis or disc disease, osteoporosis or other bone diseases, viral infections, irritation to joints and discs, or congenital abnormalities in the spine. Obesity, smoking, weight gain during pregnancy, stress, poor physical condition, posture inappropriate for the activity being performed, and poor sleeping position also may contribute to low back pain. Additionally, scar tissue created when the injured back heals itself does not have the strength or flexibility of normal tissue. Buildup of scar tissue from repeated injuries eventually weakens the back and can lead to more serious injury. Nearly everyone has low back pain sometime. Men and women are equally affected. It occurs most often between ages 30 and 50, due in part to the aging process but also as a result of sedentary life styles with too little (sometimes punctuated by too much) exercise to go along with dietary changes. The risk of experiencing low back pain from disc disease or spinal degeneration increases with age. Bone scans are used to diagnose and monitor infection, fracture, or disorders in the bone. A small amount of radioactive material is injected into the bloodstream and will collect in the bones, particularly in areas with some abnormality. Scanner-generated images are sent to a computer to identify specific areas of irregular bone metabolism or abnormal blood flow, as well as to measure levels of joint disease. Thermography involves the use of infrared sensing devices to measure small temperature changes between the two sides of the body or the temperature of a specific organ. Thermography may be used to detect the presence or absence of nerve root compression. Most low back pain can be treated without surgery. Medical treatment involves using analgesics, reducing inflammation, restoring proper function and strength to the back, and preventing recurrence of the injury. Most patients with back pain recover without residual functional loss. Patients should contact a Holistic Chiropractor if there is not a noticeable reduction in pain and inflammation after 72 hours of self-care. Medications are often used to treat acute and chronic low back pain. Effective pain relief may involve a combination of prescription drugs and over-the-counter remedies. Patients should always check with a doctor before taking drugs for pain relief. Certain medicines, even those sold over the counter, are unsafe during pregnancy, may conflict with other medications, may cause side effects including drowsiness, or may lead to liver damage. Always consult with your medical doctor or pharmacist for complete understanding about the potential for side-effects and if that is what you choose to experience. Over-the-counter analgesics, including nonsteroidal anti-inflammatory drugs (aspirin, naproxen, and ibuprofen), are taken orally to reduce stiffness, swelling, and inflammation and to ease mild to moderate low back pain. Counter-irritants applied topically to the skin as a cream or spray stimulates the nerve endings in the skin to provide feelings of warmth or cold and dull the sense of pain. Topical analgesics can also reduce inflammation and stimulate blood flow. Many of these compounds contain salicylates, the same ingredient found in oral pain medications containing aspirin. Conservative Treatments should always be considered first. Dr. Huntoon has over 27 years of successfully treating and resolving Low Back Pain once and for all. By addressing ALL the different components unique to the individual suffering will be the BEST and most complete answer for this all too common condition. I come to Dr. Huntoon because he has helped me in so many ways other Dr's have not been able to. I had a serious neck and back problem. After only a few visits my pain went away and while I was training for a marathon, I was able to ...More"I come to Dr. Huntoon because he has helped me in so many ways that other Dr's have not been able to. I had a serious neck and back problem. After only a few visits my pain went away and while I was training for a marathon. I was able to complete my training and finish the marathon and several more since. I highly recommend Dr. Huntoon. He understands the total body and works miracles!" Ideally, seeing a Holistic Chiropractor who will administer spinal adjustments, known as chiropractic manipulation, to the area(s) of your spine that are misaligned, thus causing nerve irritation. This condition of misalignment is known as a subluxation. Having your spine taken care of by a Holistic Chiropractor is the best way to go when experiencing Low Back Pain, as Chiropractic is the number one way to treat low back pain. And working with a Holistic Chiropractor will help you understand and address all the underlying reasons for having Low Back pain. By addressing each component that cause the Low back pain fully, this will enable you to get rid of your back pain once and for all and to avoid it becoming chronic and getting worse over time. Although ice and heat (the use of cold and hot compresses) have never been scientifically proven to quickly resolve low back injury, compresses may help reduce pain and inflammation and allow greater mobility for some individuals. 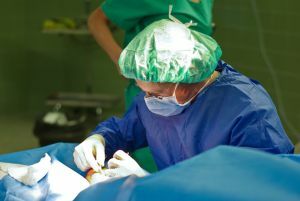 As soon as possible following trauma, patients should apply a cold pack or a cold compress (such as a bag of ice or bag of frozen vegetables wrapped in a towel) to the tender spot several times a day for up to 20 minutes per application. After 2 to 3 days of cold treatment, they should then begin to apply heat (such as a moist heating pad) for brief periods of no more than 20 minutes to relax muscles and increase blood flow. Warm baths may also help relax muscles. Patients should avoid sleeping on a heating pad, which can cause burns and lead to additional tissue damage. Exercise may be the most effective way to speed recovery from low back pain and help strengthen back and abdominal muscles. Maintaining and building muscle strength is particularly important for persons with skeletal irregularities. Holistic Chiropractors, doctors and physical therapists can provide a list of gentle exercises that help keep muscles moving and speed the recovery process. A routine of back-healthy activities may include regular chiropractic care, stretching exercises, swimming, walking, and movement therapy to improve coordination and develop proper posture and muscle balance. Yoga is another way to gently stretch muscles and ease pain. Any mild discomfort felt at the start of these exercises should disappear as muscles become stronger. But if pain is more than mild and lasts more than 15 minutes during exercise, patients should stop exercising and contact a doctor. Due to the variety of causes for lower back pain, and the treatment options available it is important to speak with your doctor if you are experiencing either severe or frequent back pain. Most causes of back pain can resolve on their own after a period of rest that allows the body to heal. However in the event of injury, or if the back pain persists after 72 hours we would recommend consulting either a physician or a Holistic Chiropractor who will work with you to better identify the underlying cause, and determine if any further treatment options are needed. Yes. Working with a Holistic Chiropractor, like Dr. Huntoon, who can help you develop a well-rounded, multifaceted approach to strengthening and maintain normal function in your back is the best way to prevent low back pain from developing. Addressing all the underlying imbalances that lead to Low Back pain is warranted. This will enable you to remedy and resolve the condition once and for all versus having the condition become chronic and costly. Recurring back pain resulting from improper body mechanics or other non-traumatic causes is often preventable. A combination of exercises that don't jolt or strain the back, maintaining correct posture, and lifting objects properly can help prevent injuries. Following any period of prolonged inactivity, begin a program of regular low-impact exercises. Speed walking, swimming, or stationary bike riding 30 minutes a day can increase muscle strength and flexibility. Yoga can also help stretch and strengthen muscles and improve posture. Ask your Holistic Chiropractor or orthopedist for a list of low-impact exercises appropriate for your age and designed to strengthen lower back and abdominal muscles. Always warm up with easy walking or a light jog before stretching. Lightly stretch before your exercise or other strenuous physical activity. At home or work, make sure your work surface is at a comfortable height for you. When sitting up straight in your chair, without your back resting against the back support, your arms should hang comfortably from your shoulders, elbows bent about 90 degrees and they should be with your hands and wrists at the level of your key-board. Adjust your chair height so that this is true. Your elbows should not be resting on anything when typing. You should be facing your computer screen head on, with your screen set a little lower than your head so your eyes angle down about 5 or 10 degrees. This allows for proper head and neck positioning to avoid neck pain or potential for headaches. You should not be looking right or left when at the key-board. Your feet should sit flat on the floor and should never dangle, as if that is true, the chair is set too high. With your feet flat on the floor, your knees should sit slightly higher than your hips in the chair. This is true when you are driving your car as well. The correct height is important as most of the work you will be doing while seated is focused on the work and not your sitting. By making sure your work-station is set up properly, this prevents strain and allows you to avoid developing tightness and muscle splinting. Wearing comfortable shoes, without heels is important for supporting proper alignment of your spine when walking. When you put your feet into a shoes that has heels, ½ inch or more, it causes your pelvis to rock forward and increases the curve in your back increasing the pressure on the spinal nerves of your low back. This will lead to increased inflammation in the low back and lead to back pain and spasm over time. Sleep on your side to reduce any curve in your spine. Always sleep on a firm surface. Ask for help when transferring an ill or injured family member from a reclining to a sitting position or when moving the patient from a chair to a bed. Don’t try to lift objects too heavy for you. Lift with your knees, pull in your stomach muscles, and keep your head down and in line with your straight back. When lifting an object of any size or weight, it is important to keep it as close to your center as possible. This prevents the stress and strain that could create a back problem. Never twist or turn when picking up an object or carrying an object, as the twisting motion increases the stress on the spinal muscles, tendons and ligaments as well as the discs. By doing this correctly, lifting with your back straight and bending your knees and getting the object close to you before lifting helps prevent injuries. Working to lift heavy objects with a partner or two will go a long way towards preventing a trip to your chiropractor. If you have any questions, please do not hesitate to call the office and speak to Dr. Huntoon. Our phone number is (845)561-2225.